Michaela Valle joined Wenzel Select Properties in 2018. Michaela’s interest in real estate started in 2015 while working as an administrative assistant for an international real estate brokerage firm in the western suburbs. Prior to that, she worked as a designer for a kitchen & bathroom remodeling company in Lisle. Michaela’s experience of home remodeling and real estate knowledge lead her to obtain her real estate broker’s license in 2016. 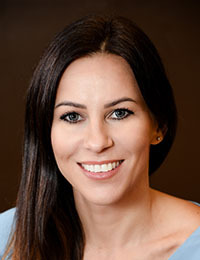 Michaela Valle is a Licensed Real Estate Agent, a member of the National Association of Realtors, Illinois Association of Realtors, and Mainstreet Organization of Realtors. She enjoys helping people find the perfect home. These resources combined with her experience give Michaela the tools and services to help clients buy, sell and rent properties. Michaela is best known for being patient, attentive, knowledgeable and hard working. Michaela was born and raised in Slovakia, Europe. For the last 14 years, she has lived in Downers Grove. When Michaela is not working, she enjoys spending time with her family.